Tanabe-san, our Regional Network Director in Japan, said that when our breath is pacing together, we are working as a team. A few weeks ago, I saw teams rowing in Boston (and a few weeks before that, on the Thames) — a beautiful metaphor of this kind of teamwork. At that dinner, Patty-san, the person who’s put up with being married to me for 21 years as of last week, brought up a different view of team: When we are “totally in sync,” are we able to spark new ideas? Or does that kind of generative thinking only happen when there’s a dynamic tension? So is a team about Harmony or Synergy? Trust – the underlying container of safety that permits sharing, risk-taking, openness. Execution – a shared focus on achieving together. Change – readiness to flex, adapt, innovate. Teamwork – exchanging perspective and information. Motivation – energy that comes from alignment around purpose. My experience is that when these elements come together — especially when forged in a context of trust — a team can both row together, and make the messy splashes that open new potential. 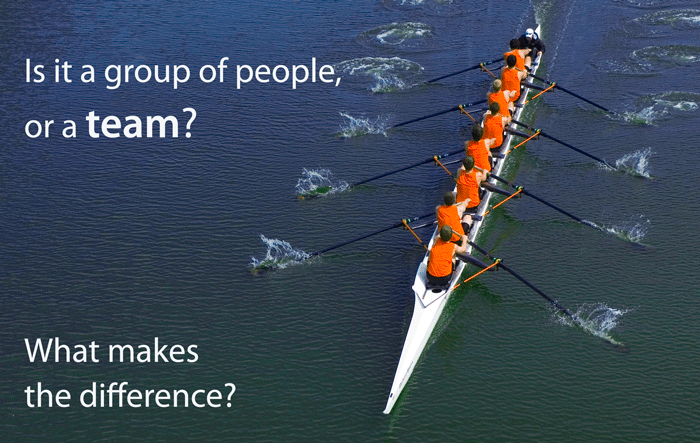 What is teamwork? Collaboration! To collaborate toward a common goal according to ones gifts and talents. To collaborate effectively – we bring our own strenghts and combine them with others strenghths to achieve. To collaborate effectively is to work together as a team. Appreciate these perspectives and contributions on this topic. I hope you can agree that ‘Teamwork’ involves some preparation. Leaders or coaches need to successfully balance empowerment & skills in negotiation (compromise) before the collaboration is clear, focused and driven. One example is in how Chief Red Cloud became known and earned the title: ‘The Great Compromiser’. He began to show signs of this magnificent skill at age 6. Teamwork is a joint effort where individual contributors unite and collectively integrate their unique ideas to achieve a specific goal. It’s an interesting blend of personality, skill, and EQ. Interesting article, thanks Joshua. To know about team work is not ough to impact behavior where people are choosing to not collaborate, communicate, nor support each other. Friends,please share to me if you could practical things to face this condition. When we were working on the Nexus conference in Halifax there were many differing opinions. I didn’t feel there was one right answer and the many perspectives made the conference quite wonderful. Were we a team? Yeah I think we were. We didn’t all sing the same note but we did ultimately create harmony. Many good thoughts in your article. Sheila is also right on the mark. I had the privilege of serving in the US Navy SEAL Teams and of serving 10 tours in Iraq & Afghanistan. Whether in war or peace, at work or in our families, the ability to work together for a common mission is a powerful and satisfying experience. I love being part of a team of dedicated individuals who find a way to blend many disparate and unique talents and skills to overcome hardships of all sorts. It’s also both educational & fun to intermix with a broad spectrum of personalities from a wide variety of cultures. I appreciate the many outlandish, over-the-top men & women with whom I’ve been blessed to associate. Hurray for strong & dynamic personalities! Great topic! Dedication: As I said in my comment to Rob, on this page, the power of shared purpose. Blend of difference: I think in the Vital Signs Model this comes in the intersection “teamwork” and “change” and must be mediated by trust — without trust, we see the “other” as an obstacle… like you, I find incredible power in the intersection of different perspectives and skills… and it’s hard to manage. This article has given me some food for thought. Personally, I believe that “teamwork” is merely an idea through which individuals must commit to in order for individual, group, or organizational goals, tasks, assignments etc to be reached. While trust can only enhance the outcome it is not required for individuals to work cohesively as a “team”. Hi Johane, intriguing question you raise. If everyone is following commitments and doing the work, isn’t that enough? I suspect without trust you can have “smooth function” (harmony) but there’s something missing… like Paul Steele’s comment on this page about the marching band. I wonder if in larger corporations there is more specialization of duties, and hence a loss of that team work sense, let alone how what a person does fits into the overall product and that to the overall mission of the organization. I have never worked in a business that developed such teamwork. Perhaps the closest I have come is in the fires/EMS service, where it is a necessity to operate as a team, and sometimes a protocol. The downside of the fire service is the inherent deficiency in emotional literacy and the lack of work environment to support a growing literacy. I will say this though. Our new chief came in and immediately began enlisting others to see how we could cut costs and improve efficiency. He also embraced and supports our work at Whidbey CareNet, and our mission is now gearing towards environmental change as well as individual change. Hi Rob, I think you’re right that organizational structures, systems, and specializations can easily undermine the real “teamness” — it becomes a mechanistic experience and we don’t feel the sense of team. Your new Chief sounds like someone who gets the power of shared purpose — absolutely key to bringing a group toward team. many teams may be in alignment, but as Daniel Goleman says, are the teams in attunement; subtle difference but big difference in performance and getting results, Imagine a marching band in alignment but not in attunement, who would want to listen to, or be a part of that team. Great metaphor Paul, very clear. When recently I was speaking to a batch of MBA students on the subject of Leadership and the importance of creating emotional connect with each other, where all are in harmony like the the two partners skating on ice. The trust is implicit. One wrong move could be fatal. They feel and think as one. There can be so many other examples in all areas of human endeavour. Yes this mastery does not happen just by wanting it. It takes many hours of practice to move from clumsily making splashes to dancing in a manner which creates music of its own. It needs empathy in all its avatars, listening, non-judgmental openness, presence, caring, understanding, support and most importantly that precious resource time. Like all words that we use and give a specific meaning depending on our context, so is this word. In my experience of developing leadership and teams, I have come across so many ways in which this gets defined. Hence the context in which it is viewed is critical. Like you say – No way is the way, similarly there could be a variety of meanings that people ascribe to it. However they are all saying the same thing – intentional alignment exists, but descriptors are what the debate maybe about. The starting point for me is TRUST. It is the point of Vulnerability too. Being emotionally intelligent helps develop this key ability or capacity to willingly trust completely, being aware of the emotions of hurt, dropped, etc.. When a group of people are able to achieve that Team Work begins to happen. People in this state are aften able to communicate without words. But thanks to our genetic coding for survival……… It will to my mind remain the single biggest challenge for mankind to resolve. A very thought provoking article Joshua … and important to me personally and professionally right now. I am a team leader working on a final business plan for my MBA. My past experience with teamwork, both academic and business, did not work well. I worked overtime on everything and felt unappreciated. Something changed with this capstone session; perhaps, the fact that I am in the leadership position. I volunteered to do extra work because I am unemployed and not raising young children. I feel good about the group … they have many different skill-sets. Without them I would be overwhelmed by the scope of the project. Harmony is nice; however, synergy is critical to make the leap from average to excellent. The following are excerpts from my commitment statement. I believe I have learned much about leadership and ethics from you, Frank Bucaro, and several other people that are great examples and mentors. I know that the team is not all about me; it is all about us working together to create something greater than any one of us. It is this realization that I find exciting and motivating. Thank you, Joshua – you have been and will continue to be a much appreciated leader and mentor. I enjoyed the article and love the comments, as it gives me a lot to think about while I grapple with developing my team, from clumsy cooperation (often dropping the ball) to a graceful dance (not there yet). Some good ideas for my next move, thanks to everyone for your views. Team reminds me of a sense of Unity, protection and care, a no-fly zone where we can feel Safe. How do we develop excellent performance, together? •	Trust – the underlying container of safety that permits sharing, risk-taking, openness. •	Execution – a shared focus on achieving together. •	Change – readiness to flex, adapt, innovate. •	Teamwork – exchanging perspective and information. •	Motivation – energy that comes from alignment around purpose. •	Common direction – the teams experience of having common goals, tasks etc. Let’s compare the two “Four factors” for teams. In the EQ’s definition, of course, emotional factors (trust and motivation) are the most important factor. In the systemic perspective (Karl Tomm (1988), Pearce W.B. (2007),Gergen K.J. (1997), Cooperider & Srivasta 1997) relations are the most important and more than individuals performance. Good relations, between the member of the team, is crucial to the performance of the team. A team’s performance is created by the communication in the team and the teams ability to create common reflective practice in the team. The team members ability to ask questions like “how do we cooperate to solve our tasks as good as possible?”, “which roles are important for this task?” etc. The two perspectives, EQ and systemic, is created from to different paradigms. In the first one, the performance of the team is individualistic. In the last perspective, the performance is connected to collective factors; and most important, the teams ability to make reflections upon itself, – How do we learn and share our individual practice together? What about our performance at the moment – what is excellent and what can we learn from it? What is our level of trust and do we develop it toghether? How can we share our reflections upon (individual) motivation, and what to learn from it? What is our practice of solving new tasks? And how can we develop our common practice in the right direction when creating new tasks? 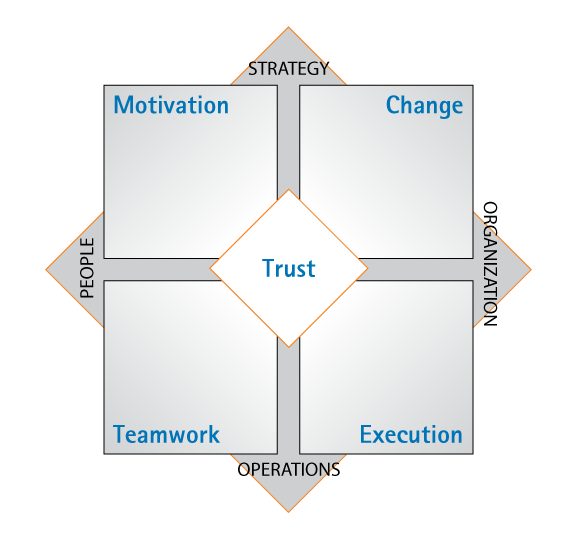 In order to create a team that has ability to make reflections upon itself, my experience as management consultant, trust is the first step towards this creation. Trust is therefore the crucial pillar for a team, for it can row together: and the important factor for this, is to create a common reflective practice which support trust. Hi Andreas, thank you for the detailed and thoughtful comment. Often we talk about “Head+Heart+Hands” — we need to put the systemic perspective together with the emotional insights — and then take action! When I have worked with leadership teams in schools and not-for-profits it has been my privilege to work on helping them redefine what teamwork would be for that team. As each of the teams grew in their communication by having more clarity around each of the team members’ roles and responsibilities each team member began feeling more appreciation and respect for each other, their talents, skills sets, etc. Also it was always important that the leaders in the organization had insight into the day-to-day operations of the organization through the point of view of each team member. Many times this is not happening in the organization. Another important ingredient for building that trust. which is the bedrock of the team and teamwork, is sharing within the team what matters to each of them. What times in their life have been highlights? What has mattered to them? This exercise has been one of the powerful exercises of any of the training. These type of exercises bring the team together at their “feeling” level. When the trust is continuing to be built over time, then we have the safe haven for innovation and true teamwork: the coming together of many ideas in a brainstorming way, with no judgement at first until refining the ideas. I liken this to “design thinking” that I was privy to with IDEO. Whenever I have been in a team that welcomed new ideas it was so exciting and invigorating! Trust was present. Refining a shared purpose is so important for the team and teamwork. However, building that trust needs to happen first. I could go on and on about building team as I love this topic. Thanks, Josh, for sharing this with us. My idea of teamwork is when you can share efforts and results too. This as a consequence of my strong experience in managing people in a retail chain Thanks Josh and all for this demanding conversation! I believe effective teamwork is driven by ‘unity of purpose’. Sharing the vision and objective with the team is one way of imbibing unity of purpose. This article couldn’t have hit my mailbox on a better day..As I step into a two day workshop with Senior Managers on Teamwork, my mind is overflowing with thoughts!! On a softer plane, its about sharing, bonding, caring, and of course standing by each other. Look at the family as a team…brings a smile to my face as I think of my own family:-) I also feel, having a common purpose, knowing why we are together and where we are going together helps! This is one topic where the thoughts and perspectives would know no end..
Teamwork is a dynamic process which must be a minimum of elements such as: at least one goal, much order, flexibility and within a systemic approach subsitemas all systems and people should be able to build strong relationships with a lot of empathy and ability to change. Great article and lots of good ideas in the feedback. The one thing that I would like to add that all team members must have a vested interest in a shared outcome. Trust is crucial as the members of the team must believe that the others share the desire for the same outcome and are doing their best towards achieving it. All members must believe that the results that can be achieved by the group are greater than any one on the team can achieve individually. As has been stated there is a shared belief that effort and reward will be shared in some manner that is agreed upon by eveyone. Egos need to be kept in check for a team to function well. Hi Harvey – sometimes we use the term, “stakeholder” & often there’s no real stake… Maybe feeling ownership requires some share in the value created? Does it have to be $ value? To better explain, still using the rowers as an example, they are all supposed to perform the same task, in the same rhythm, to win the competition, with no interference on others, even if they want. On a soccer team, they are supposed to perform their own tasks (different ones: goal keeper, defense, mid field, attack) but also cover their mates; if one gets injured, the others need to accommodate the situation (“extra mile”) to still pursue the victory. And there is no need for internal completion, once different skills are required from each one. It is just another way to see/illustrate it; helped me a lot when explaining to my teams how to work together. Exactly, you got the message! That is what I do on my workshops and, being in Brazil (where soccer is national sport! ), I do use it a lot, fits very well. Also we can use video shots from soccer games to explore some specific aspects of teamwork. A group of people, working together, towards a common goal. Working together in actuality, not in a metapohirical sense, across geographical divides. Also the ability to know each others strengths and weaknesses and utilize & support them effectively. Belief in the common goal and its relevance / importance. Competing against themselves or others, not within the team. Trying to make a positive difference. Another provocative post, Josh! Teamwork is the ability to engage together around a shared purpose in both calm and choppy waters and move respectfully from conflict to collaboration. I think really effective teams thrive with both “dynamic tension and harmony.” Differences will always emerge in any relationship with two or more people. In a paper by Losada et.al, flourishing teams have a positive to negative ratio of interactions of 5:1 and a ratio of inquiry to advocating their own point of view of 1:1. If teams go beyond 11:1 positive to negative interactions they are living in a “pollyanna”” state (though the researchers say that’s not very common). When I am at my best on a team and conflict emerges, I am open, curious, aware of my assumptions, listen, and speak with both courage and compassion. So being on a team or in any relationship is a great place to see where I still have to grow! Thanks Colette! Great data. Maintaining 1:1 inquiry:advocating is quite a benchmark. Instead of push push push on “this is right,” in that situation HALF the discussion will be asking and listening… good practice!! i have always had a problem with the word synergy and I know i will be termed as being cynical, but only being realistic and Indian. Worked in teams (with member of varying competencies) since three decades and believe that synergy can only happen if each team member is as motivated and committed as the other. What has worked for me is there have to be leaders AND there are teams. I like the word harmony which is described as a pleasing combination of elements in a whole, collaborating with the order and harmony of the universe. For this to happen, leadership with a mission statement who can inspire the team is mandatory. synergy is like the highly overrated concept of positive thinking or this empathy and positive regard that we use in counselling and training. Because after all that positive thinking and synergising and all that archie card business then what. i am still left with a ‘team’ where everyone excited about this synergy and two and three people of the team do everybody’s work and rest are generally mouthing platitudes and trying to get away with doing as little as possible. Not only does this happen at work but also at my work inside the home too! Traditionally Indian approaches believed in the concept of ‘purushartha’ which loosely means proactivity or the will and determination to follow your noble goal in life. As a leader I have a goal but more than positive thing and regard for my team, what is important is getting my act in order and moving towards the goal, For this ‘purushartha’ from my side is paramount.. The next challenge is motivating the team, which if you are a leader, you will be able to do it with creativity and zest. If i am able to do that i have fabulous teamwork. Note i do not say great leader , as great is synonymous with leader, like development and not sustainable dev. that is why for me its not about teamwork but if teams have to work, the leader needs to be in charge. like the conductor in an orchestra, where she does not sit in with the team but guides them like the guru standing somewhere in the background. Thanks for the additional perspective Lata. It sounds like you’re saying: Synergy is unrealistically out of reach, so let’s focus on what’s viable: harmony. Tai Chi is a clear metaphor for harmony. In the case of Tai Chi, is the result enhanced by increased harmony, or is it really a situation of individuals contributing — and whatever is accomplished is at an individual level? I mean: is it realistic to expect the total to be more than the sum of the individual parts? That’s the whole idea of synergy… 5 people add the value of 10 because they become more than ‘smooth,’ they sparkle… maybe it’s a myth? I’d like to learn more about purushartha – sounds like a powerful concept. There’s an element of “team” that has been alluded to in this discussion, but it has not been explicitly stated. Risk-taking, readiness to flex, adaptability, compromise, vulnerability, willingness and ability to trust, feeling safe, sharing, openness, ability to change, egos…kept in check, humility, and others imply that something must be forgone when one participates on a team. My experience has shown this to be true. To be an effective team member, one must be willing and comfortably able to forego some of “self” to further the goals of the team. A crew member must forego his rhythm and embrace the rhythm of the rowing team if the crew is to be successful. A soccer player must forego opportunities for personal glory in order to give her team better chances to score. In the world of work, a team member may have to forego his ideas and implement the ideas of others, relinquish control and let others edit his written work, allow others to manufacture his design, forego marketing the product he made, use a layout suggested by another team member, or do the “dirty work” while others do the “fun” work, all while honoring cultural norms and traditions that may not be his own. If a person is unwilling to let this happen, there is no benefit to his presence on the team. Hi Orrin – important points you raise. Recently I met with a group that wants to be more of a team, and I asked: Would you be willing to give up some of your autonomy in exchange for more cohesion? So far, they’re not… and so remaining a group. Thanks for bringing this up!